The words “melting snow” probably sound pretty good to most people who live in the northeast US. As a transplanted Midwesterner, snow doesn’t really phase me, but I must say, this year it’s been really…intriguing in Massachusetts. And it always seems to snow on the same day each week. 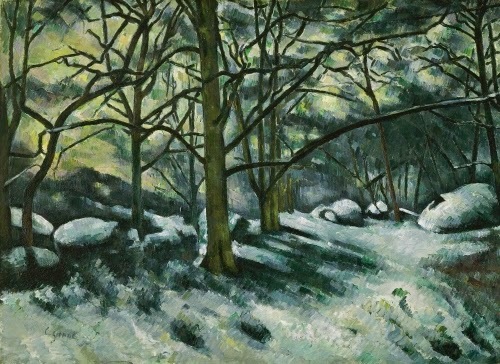 Anyway, what better way to think about snow than a) when it’s melting because it spring might be a-comin’ and b) when it’s in a beautiful Cézanne painting? With those two reasons, how can one lose? Among the many “favorite artists” I cherish, Cézanne is right up there toward the top with Monet. These two guys had a major impact on changing the direction of painting in Western art, and really, their work led to abstraction. Paul Cézanne’s paintings of the 1860s were dark and painterly, often involving mythological or literary subjects. Cézanne had studied the great masters of the Renaissance and Baroque, as well as Romanticism, especially the work of Eugène Delacroix (1798–1863). He also gravitated toward more unconventional contemporary painters Gustave Courbet (1819–1877) and Edouard Manet (1832–1883). By the late 1870s, Cézanne felt that Impressionism was too restrictive. Formally, Cézanne was drawn to Baroque and Renaissance art because of the emphasis on structure and balance. He resolved to work with a style that combined the Impressionist technique with the underlying structure of basic geometry of the Renaissance and Baroque. Because of this shift, his work is often classified as Post-Impressionism. The palette of this work is a relatively conservative, traditional one of earth tones with a grey-green underpainting. 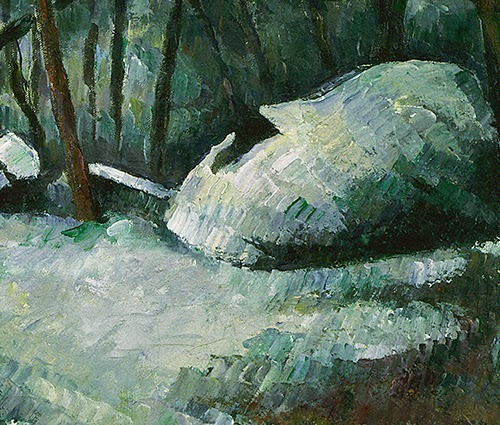 In many of his works from this period, Cézanne worked areas of the canvas with a palette knife, seen in the snow of this painting. The result is a thick impasto, visible in this work, and heavily defined, almost sculptural forms. Studio activity: On a piece of brown or green construction paper, draw a group of bare winter trees in black chalk. Using white chalk to indicate snow, and the brown or green of the construction paper as the ground, indicate a scene of melting snow. Allow the green or brown of the paper to show through in spots. Use other colors of chalk such as blue or green to give texture to the snow covering.